As I have mentioned a few times in passing, we’ve hired out our patio paver project. Some 750sf including two walks, three elevations, and (after pricing out stone) a short retaining frame consisting of (32) 6×6 pressure-treated timbers. 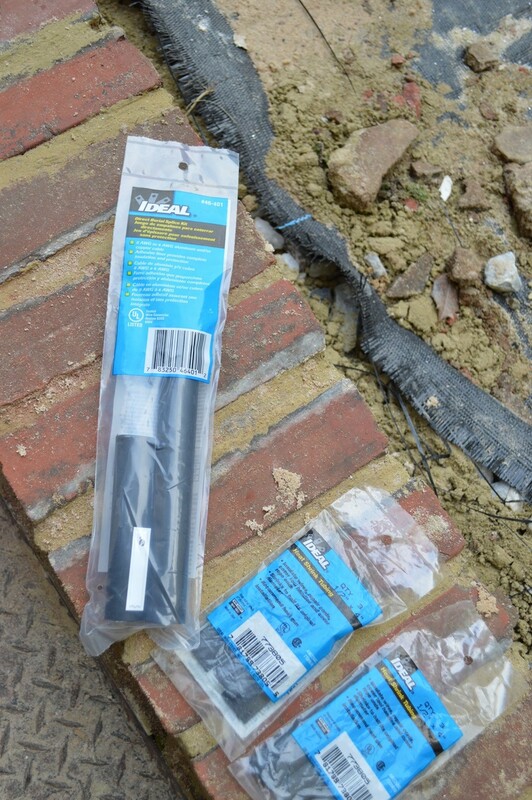 Included with the patio project: The repair/re-routing of two downspout leaders, repair and re-pointing of small sections of brick at both a small area of the foundation and at the basement door well, plus … new patio lighting, in some locations. While included in our guy’s contract, I decided to install the new post lamp myself. 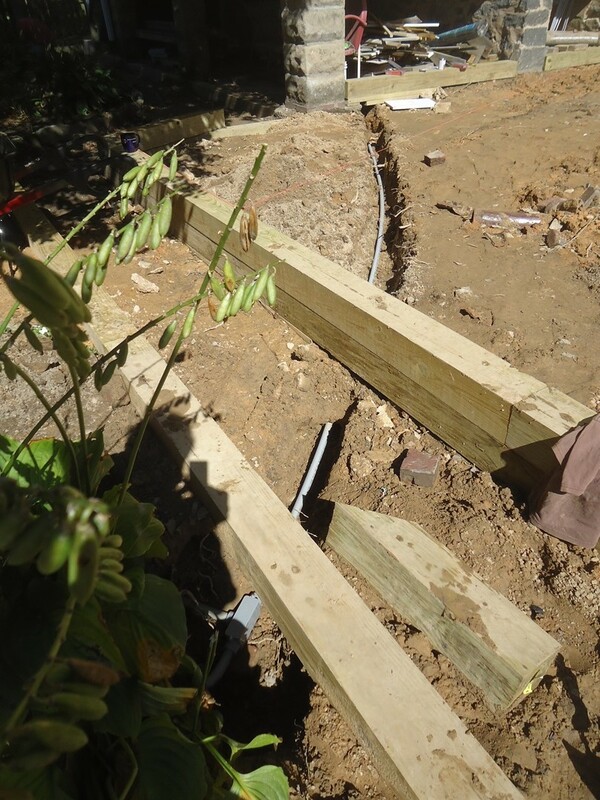 That is – new wiring needed to go into the ground before any pavers could be set. 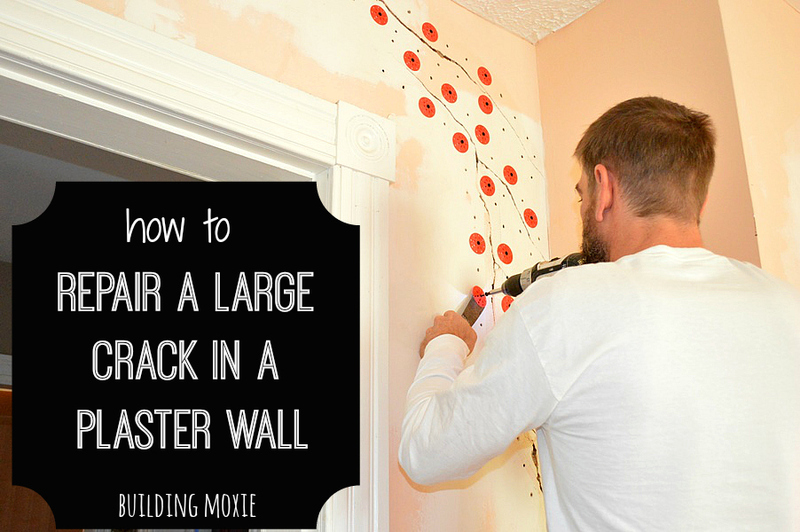 I won’t go so far as to call this post a How to … a Tutorial. 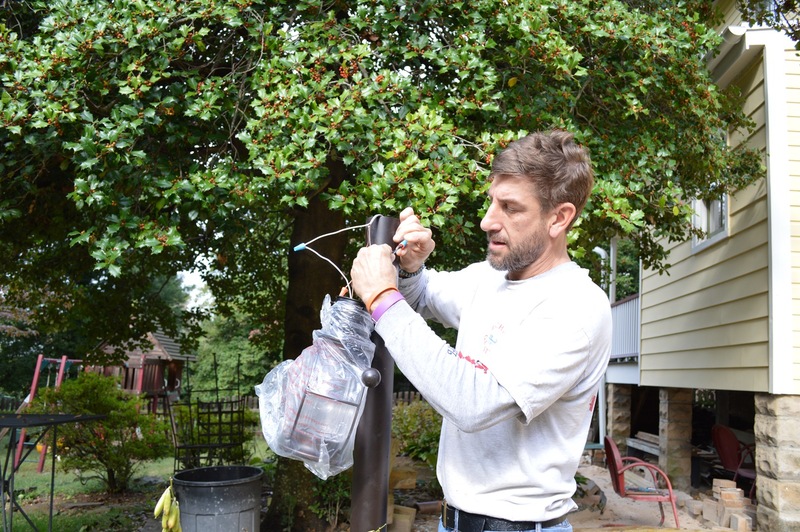 I’ll call it instead – (Me) Installing a Post Lamp … a What I Did and a What I Learned. 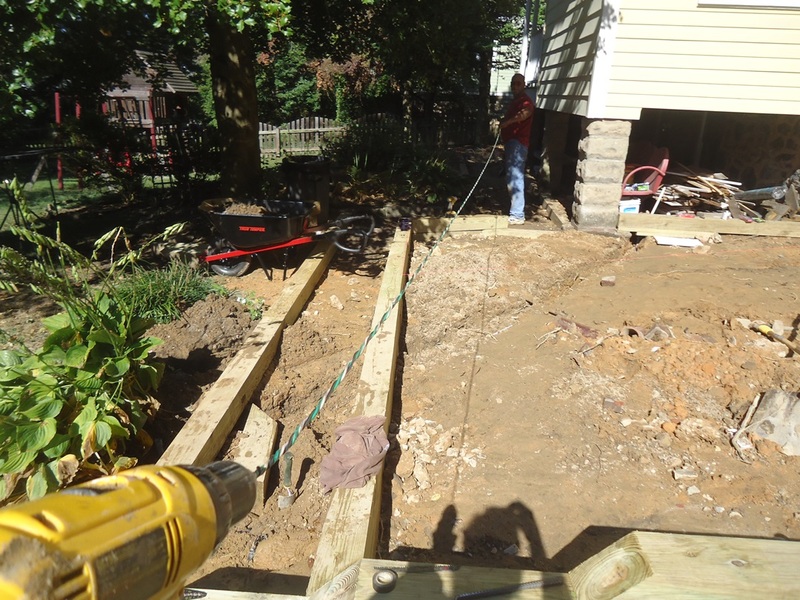 It’s the first in a series of posts (I hope) about our patio project. After careful consideration, I decided to place the new post lamp in the exact same location as an already existing, old and not functioning post lamp. (It had never worked from the time we bought the abandoned “farm” about 7 years ago.) 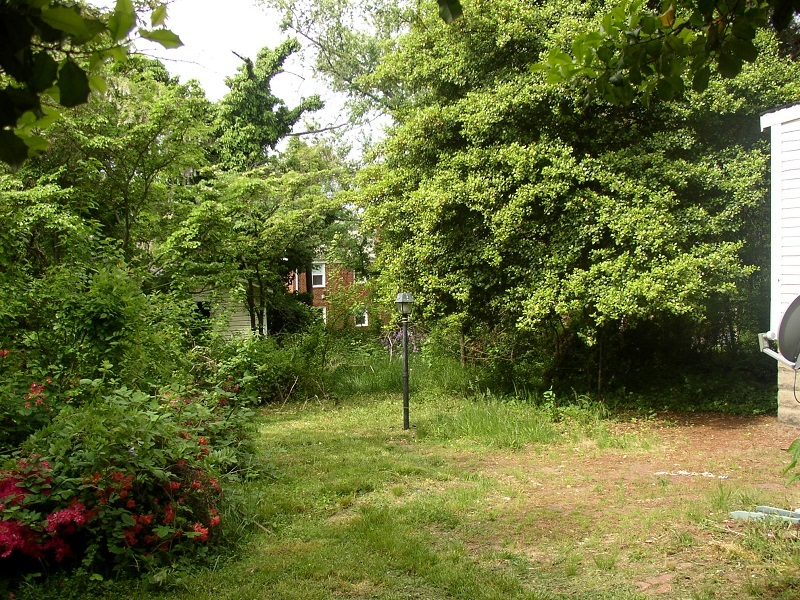 It sits at the intersection between the patio and a concrete path, which itself runs down to a small shed. Pulling out the old post lamp, I could see just how badly corroded existing wiring was. Surely, the reason that old light never worked. Okay, I could have dug that one a little straighter. What are my Post Lamp Wiring Options? I took quick look through my (cheaters) code book. I identified the possible configurations for wiring on a post lamp project. 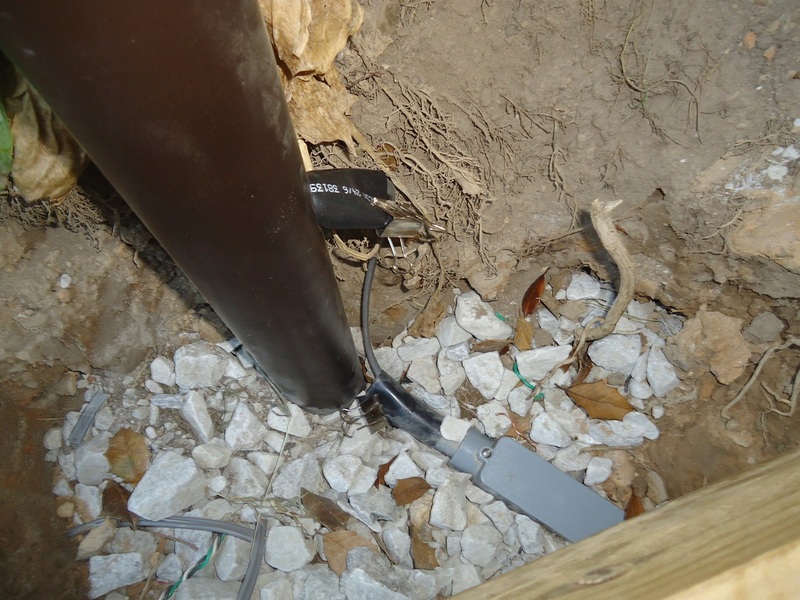 Option one: UF (that’s underground feeder – electrical wire installed directly into the ground and usually noted by a gray sheath color). For this run, a minimum depth of 24” below grade is required. 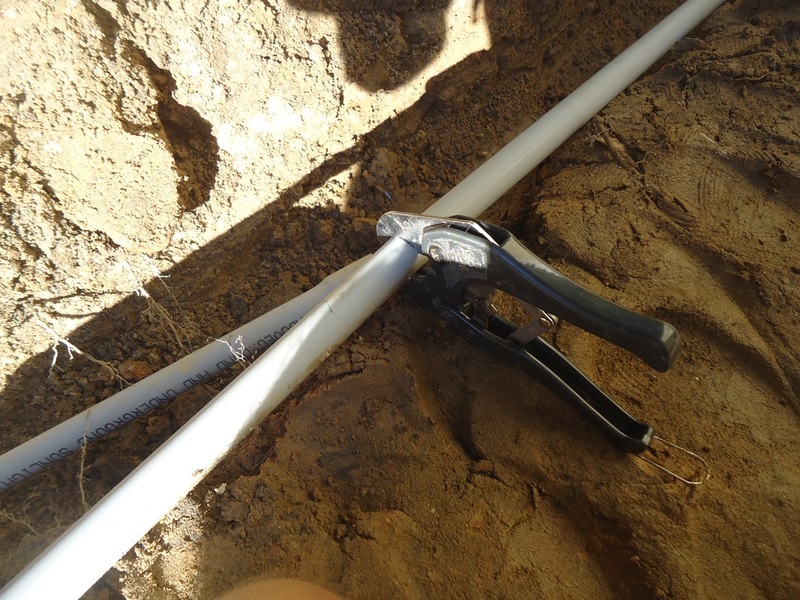 Option two: UF (or wire in conduit) at only 12” below finish grade. That circuit though would require ground-fault protection. 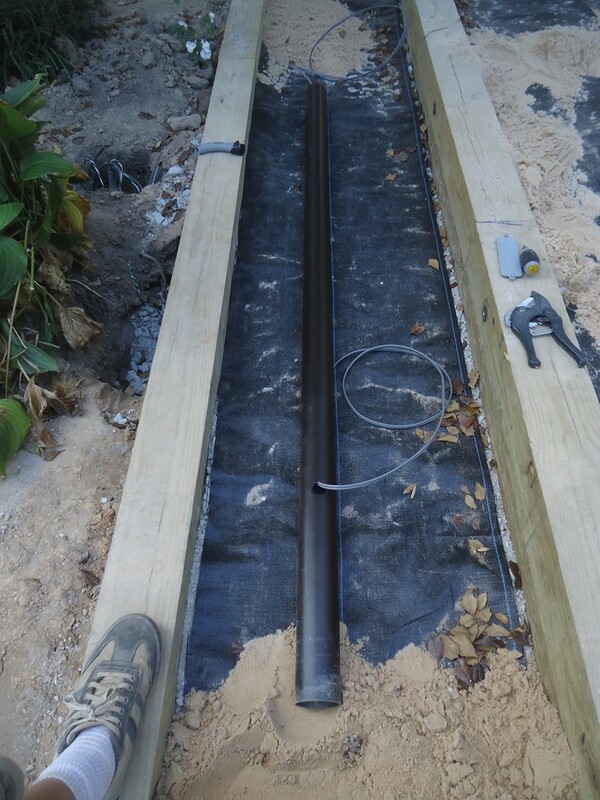 Option three: The one I chose – gray PVC conduit buried to a depth of 18” (… ish). Since I chose PVC (it is glued together just as you’d glue Schedule 40 plumbing pipe), I also selected solid THHN (which stands for “Thermoplastic High Heat-resistant Nylon-coated”). 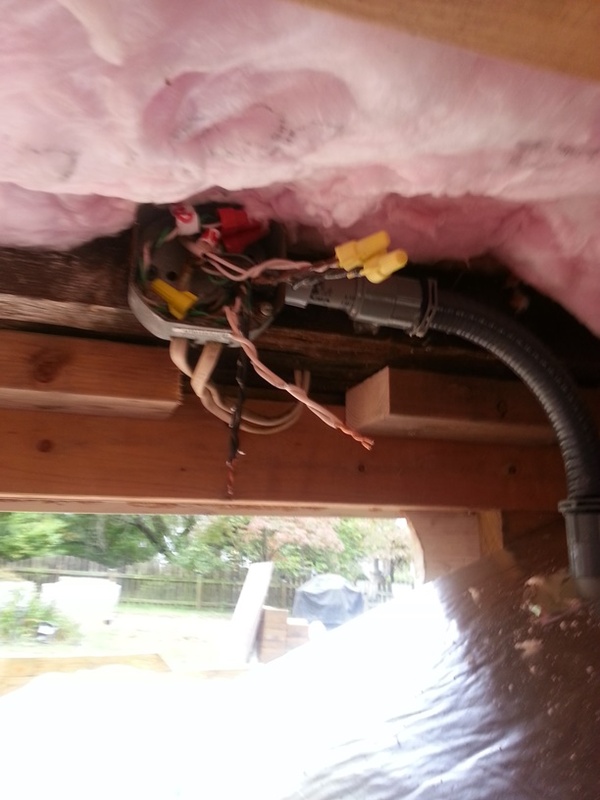 THHN is very similar to traditional sheathed NM copper cable (aka Romex), but doesn’t have the outside sheathing and/or the insulation run within the housing. 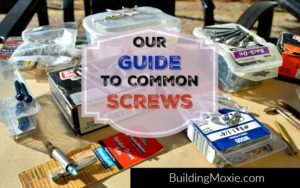 Romex could overheat if placed within a conduit. 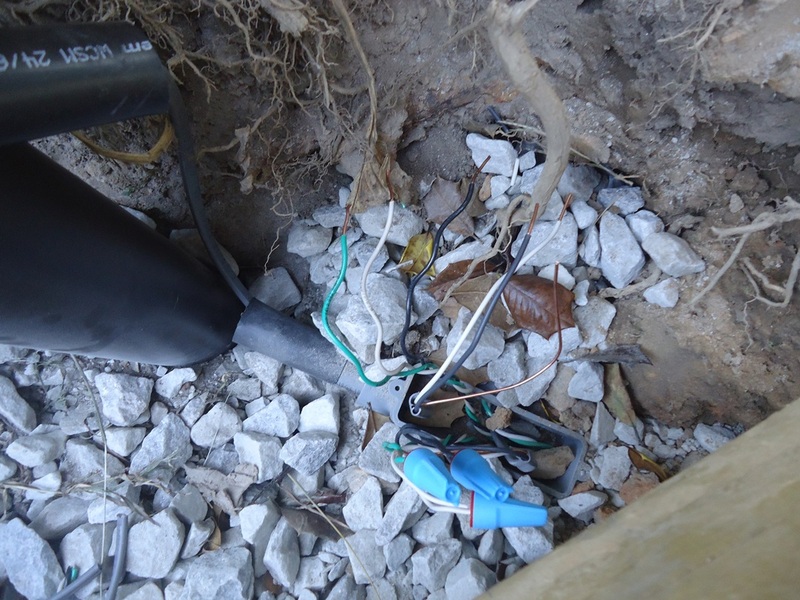 Aside: When I ran my wire for the post lamp, I took the time to run additional sets of wires both for a circuit that I plan to dedicate to our pond. I also installed a “just in case” 12-wire, if someone ever decides they want a 20-amp circuit for one or both of the sheds. 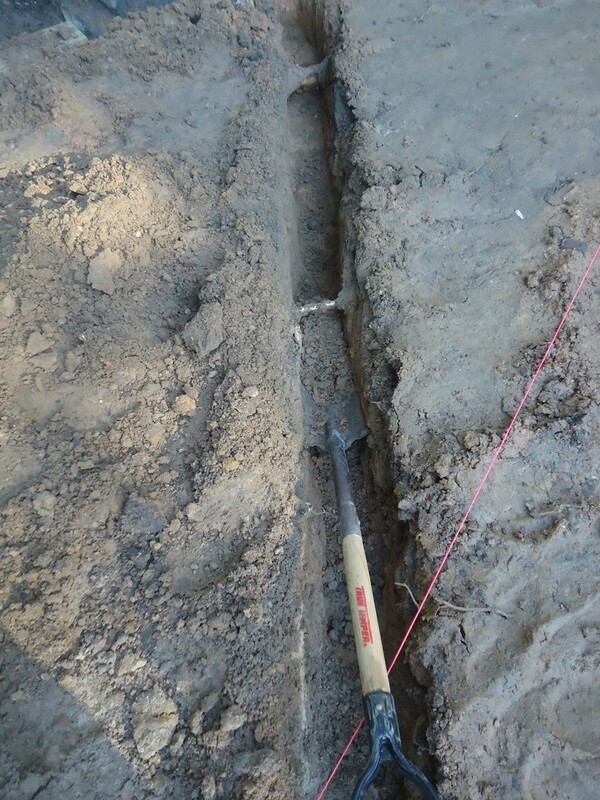 As instructed by the packaging from the post lamp’s pole, I dug a hole using a pole hole digger to a depth of around 18 inches. 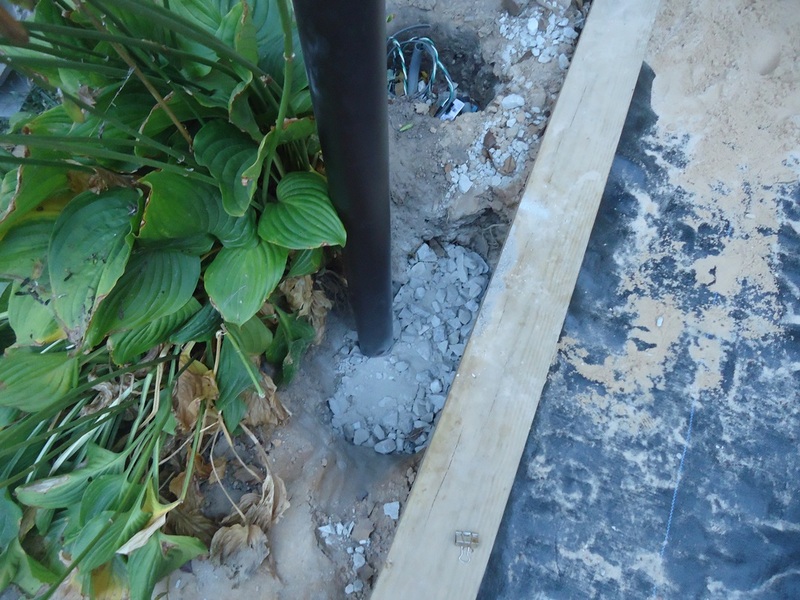 (Where this post lamp sits is actually already about 6 inches below the main patio.) Because I intended to branch for the pond “lead” I mentioned above, my hole was a little larger than would be required for only a post lamp. I installed a pull elbow at that branch location. At that pull elbow and feeding up through my post lamp’s post, I converted to UF – just a little easier than having to figure out exactly how to deal with the THHN as it entered/exited the ground. 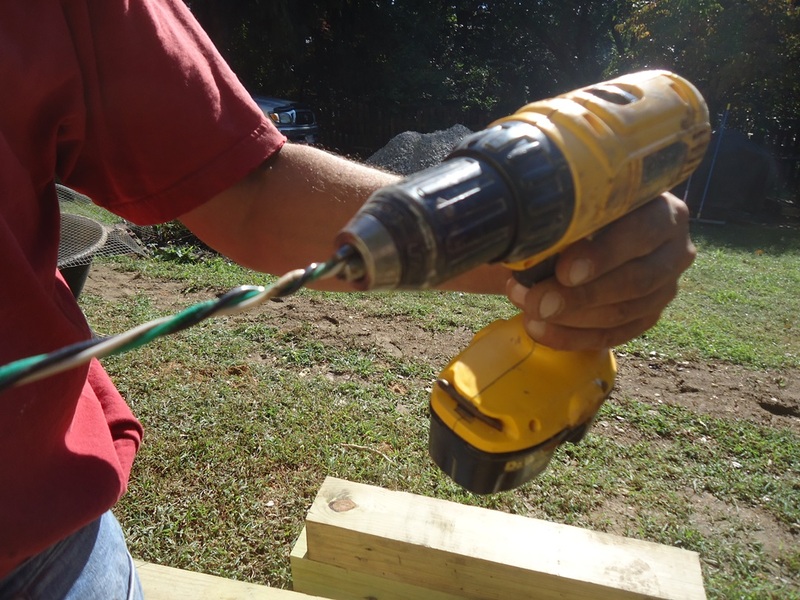 If you had been following on our Facebook page, you know too that we twisted the THHN wire using a drill driver. In essence, this takes three wires (a black, a white and a ground) and makes it, well, one. 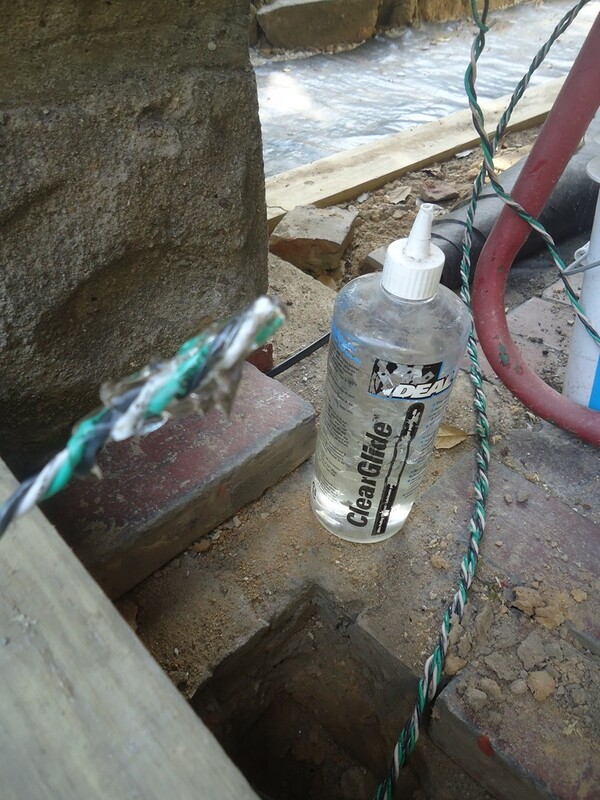 More manageable than having to feed individual wires through a length of conduit. 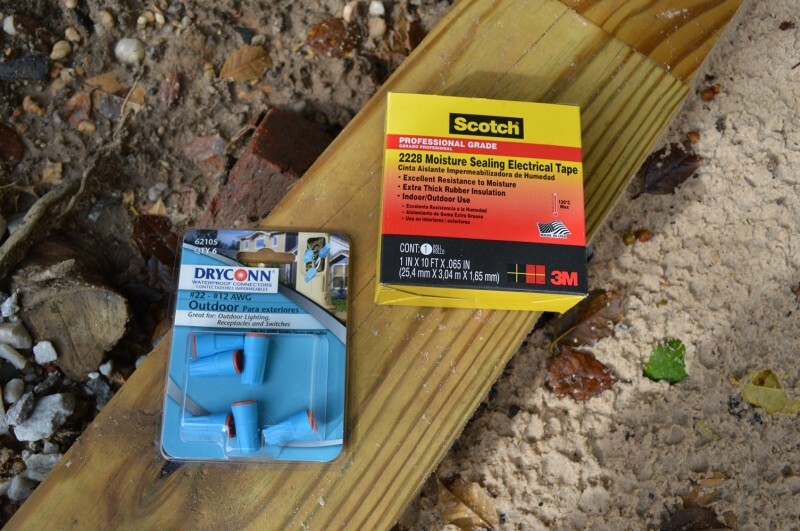 Another Aside: Because I wanted to protect both where wiring exited my pull elbow and where it entered the pole, I cut my heat shrink tube in half. The full length here would have been more useful. As I heated the tubes (I used binder clips to compress them), guess what – they shrunk. On looking back, I should have slit them and sucked them down using zip ties before heating them with a heat gun. After I temporarily situated the pole, I added some leftover (from the patio) crush and run (CR6) stone to my hole. I did this as I was routing the wiring into the pole and as I was setting up for final connections. On top of that, another couple of shovels of CR6. 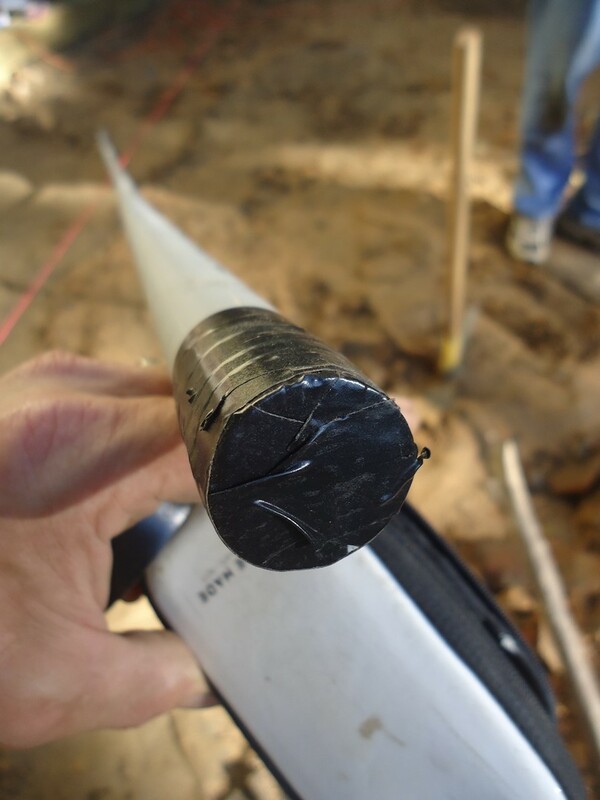 Then, in a method typically associated with setting mailbox posts – I filled the hole with Hi-Strength Sakrete, dry. 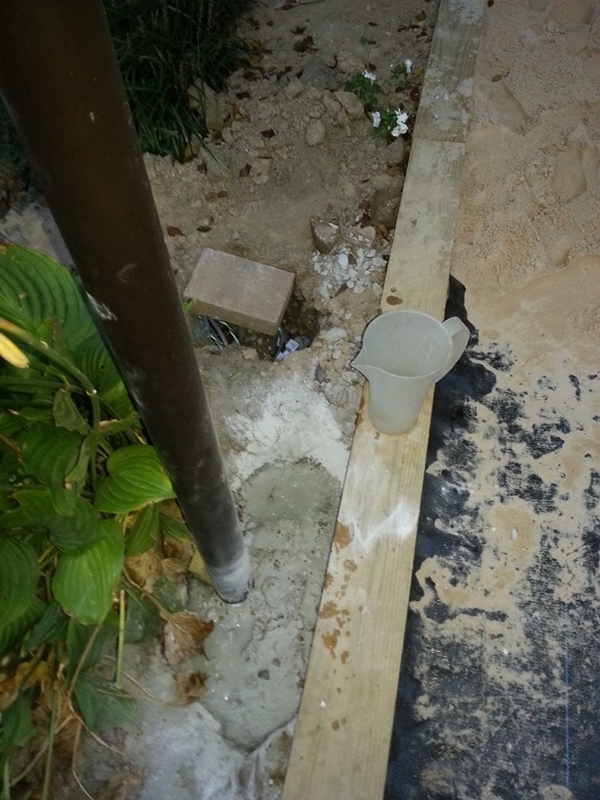 I added measured water – 1 quart to 20 pounds of concrete and poured it over as I tamped. 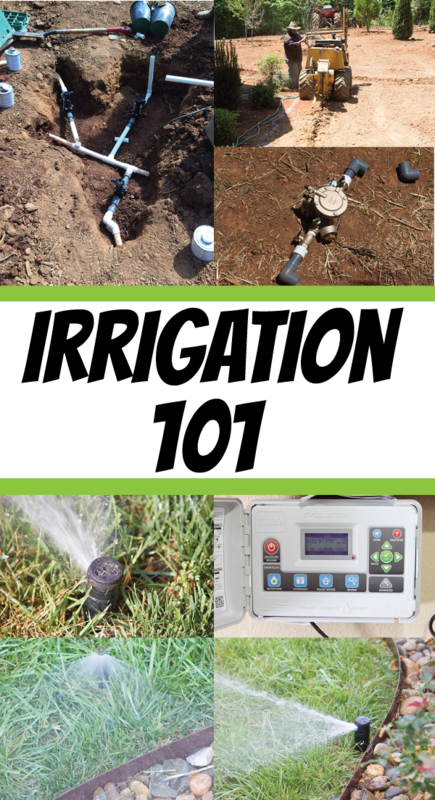 While it remains somewhat dry, it will continue to receive water from the ground and will continue to strengthen over time. Before I cover it with earth, I plan to give the hole a shovel or two more of CR6, dampening that too with a sprinkle of water of its own. 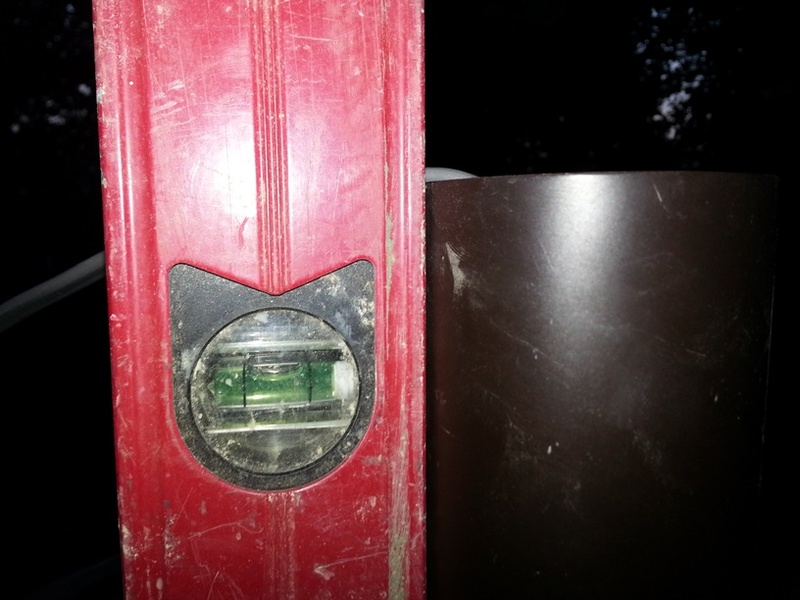 I checked for level on three sides … adjusting as needed. All that was left was to install the post lamp itself, making the connections at the light. I won’t go too much into that here other than to say it is like installing most other lights. In my project I employed both waterproof wire nuts and the moisture sealing tape mentioned earlier. For more info, I always recommend referring to the manual that is provided with your light. While some posts come with a day/night sensor (dusk to dawn, on and off), I decided to forgo it here. I already had a motion-activated spotlight serving the patio. 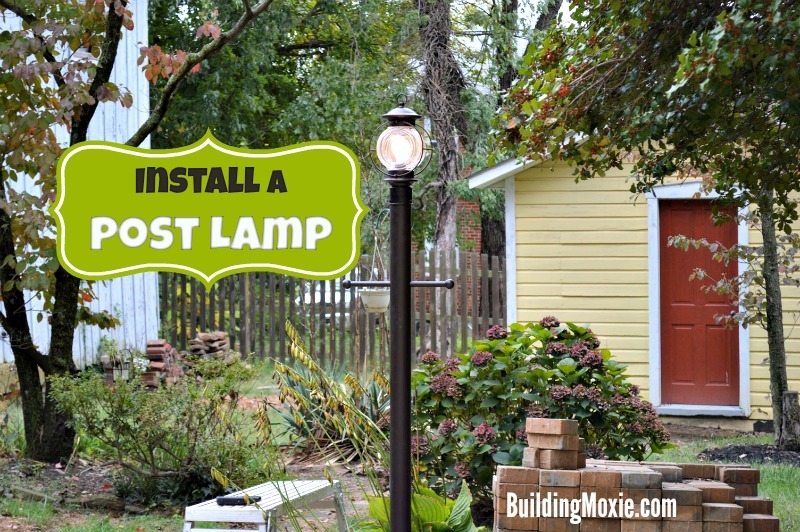 For additional information, and another approach at installing a post lamp, this article article from Popular Mechanics – How To Install A Lamp Post In Your Yard. That’s it, I hope this helps and I think up next – Re-Pointing Brick. May your outsides always be lighted. Thanks for reading. Nice explanation JB and nice price on that post lamp! not too windy? ha! thanks Sandy and thanks for popping over. Thanks for the explanation! Great post!